This No Trespassing, Trolls Territory Poster is a plastic poster. 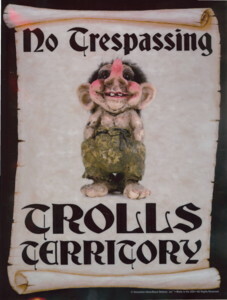 This No Trespassing, Trolls Territory poster features a Troll with the words "No trespassing, Trolls Territory." This No Trespassing, Trolls Territory Poster is 11 in. high and 8 1/2 in. wide.